Reiner Knizia's Colossal Arena is a reprint of the classic Titan: The Arena, published by the Avalon Hill game company. Colossal Arena features gorgeous new art and four brand-new creatures - not included in the original version - making Colossal Arena a new and unique game experience. In this game of gladitorial mayhem, eight monsters battle in the arena for your amusement, while crazed spectators leap into the fray to help their favorites. Players place bets on the fantasy creatures they think will triumph. But beware! - each creature boasts individual skills and abilities, and players must manage the spectator cards while guiding their bets to maximum payoff. Tension is high as one creature is eliminated every round. Will your favorite prevail? Or will your champion be destroyed and your fortunes lost? Slay some mythological beasts in this well-designed card game. Skillful cardplay, and proper use of your sponsored beasts' powers, are the keys to victory. If you like cutthroat action with a fantasy theme, you'll love Colossal Arena. Colossal Arena has a very cool theme. The mechanic of betting on monsters/gladiators and trying to keep them alive so that your bet pays off is fun and intense (especially when your monster gets killed late in the game!). Fantasy Flight small box games are usually a safe bet and this is no exception. Supports up to 5 players. Enjoy! I love the different powers for different creatures. Plays best with 4 players or more. Great game in a small box! Try to keep your champions alive while killing your opponents' fighters. A good amount of screw your foes! Love the graphics and the fantasy theme. 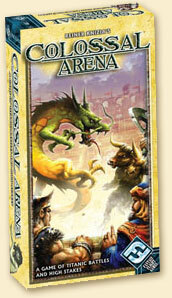 Colossal Arena is a betting game with cards (creatures) that have special powers that influence gameplay. This works very well, since there are enough powers to keep it interesting and not so many that it feels chaotic. There is a lot of room for good tactical play, and no two games will feel alike due to the very varied powers.